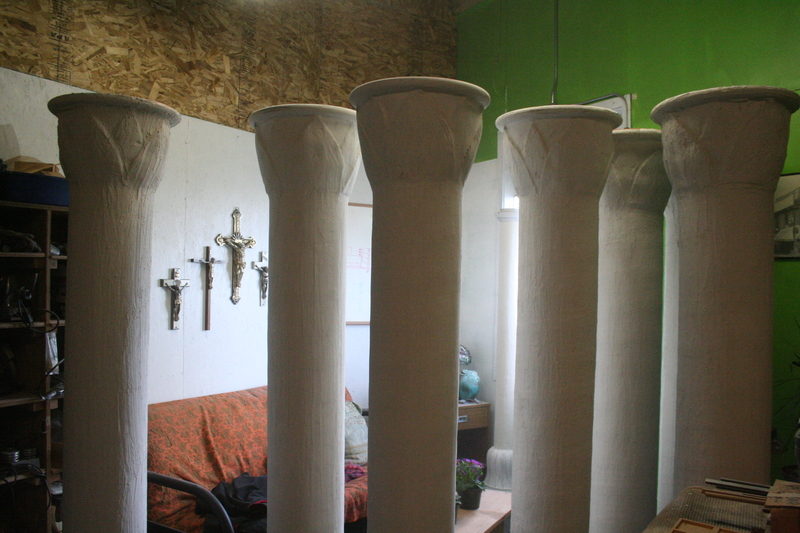 The lotus pillars for the SunFest Temple of Isis; "mudded" and sanded before we paint them...which is the next order of magical business. My—what a busy Isis weekend it has been! The photo above shows the lotus pillars that will uphold the central shrine. They have been “mudded” and sanded. Next stop is final detailing, then painting. We will be painting hieroglyphs that are invocations to each of the nine aspects of Isis we are honoring at the Festival. You particularly have to love the crucifixes in the background! Ha! They are part of the artist’s studio we are borrowing for temple building. Four of us sanded and sanded and sanded and sanded those suckas. I wore off part of my finger…and so now I know which finger I tend to press with! Uh, the middle one. Hmmmmmm. Then today, Sunday, our musician priestess brought her recording equipment and recorded about eight or nine of us chanting the various epithets of the Goddess. She will take our chanting and turn it into a fabulous recording that we will use as ambient music in the Temple of Isis throughout the Festival. The recording will also be available for sale during the Festival. When our music priestess gets the mixing done, I’ll put a link to a sample of it on this blog so you can hear it. And, of course, order one for yourself. Cuz, I swear, you’re going to want one! Goddess worshipIsisIsis worship todayPagan SpiritualityRitualSunFest 2010Who is Isis?